Hallelujah Lunch: The Kids Are Back in School! Back to School! I dreaded these words as a kid, but as a parent, it brings a bit of relief. Gone are the careless days of summer, where the kids sleep in, there’s no homework, and sports commitments are minimal. But, I crave the routine that school brings and quite frankly, by August, we are ready to go back. To celebrate the new academic year and see friends I haven’t seen all summer, I invited a few of them over for a Hallelujah Lunch – as in Hallelujah, the kids are back in school! Catching up with friends after a summer hiatus! It’s such a busy time of year, so I made sure this party was as easy as possible. 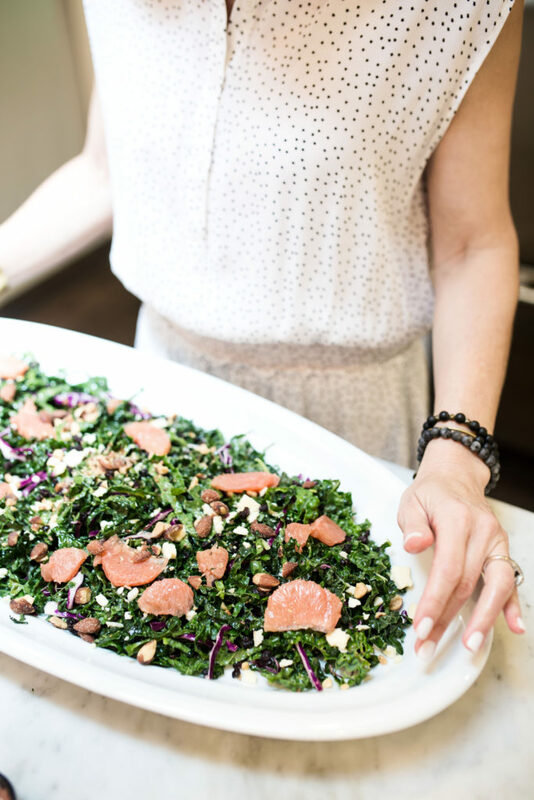 This is the time to call in for help – and I enlisted my favorite fast, healthy restaurant for take-out. 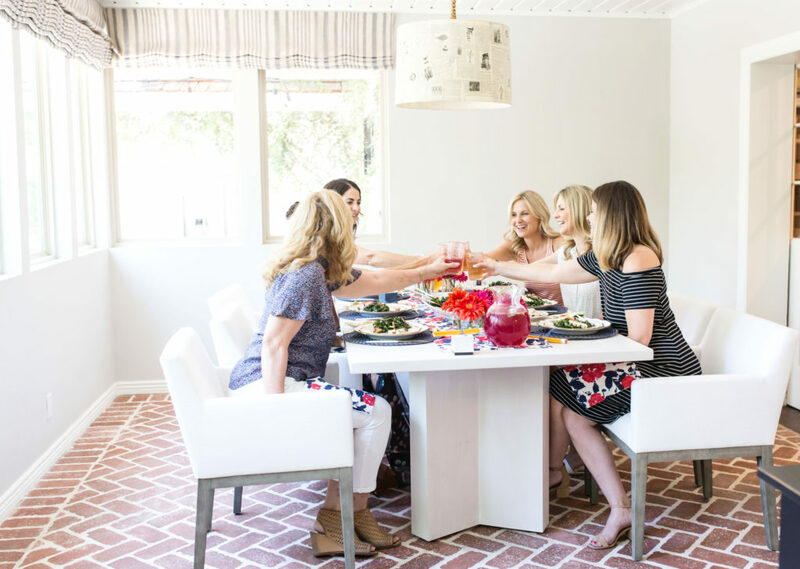 All that was left to do was arrange everything on a platter and enjoy catching up with friends. Set a few days before the party, I used what I already had for table decor, making sure that it was bright and cheerful. Home Goods had this gorgeous Kate Spade floral table runner and napkins, so I grabbed those earlier in the summer as soon as I saw them. 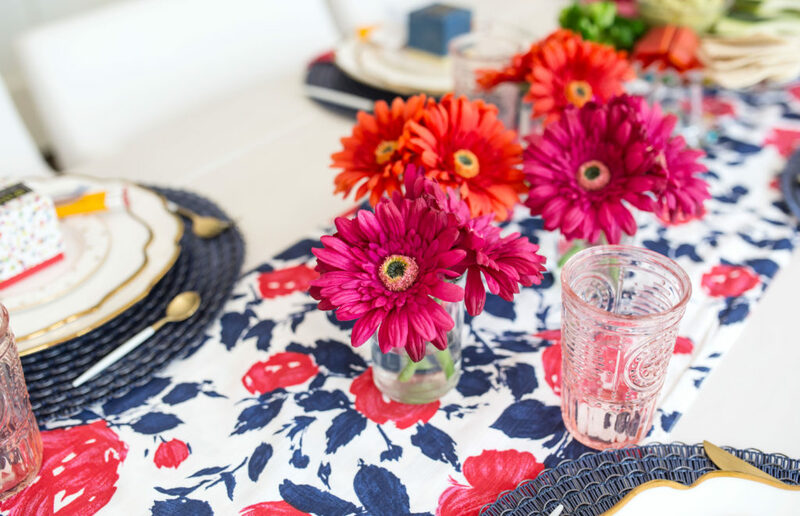 Gerber daises were very easy to arrange – alternating colors of orange and hot pink give off a fun vibe and coordinate with the Kate Spade table linens. 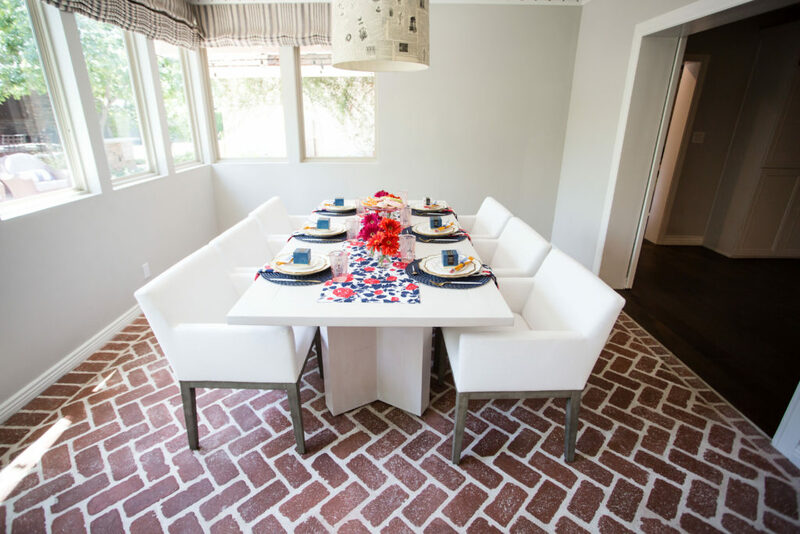 Lenox is one of my favorites for entertaining. Their dinner plate and accent plate from their gold-rimmed tulip-shaped collection is one I go back to time and time again. 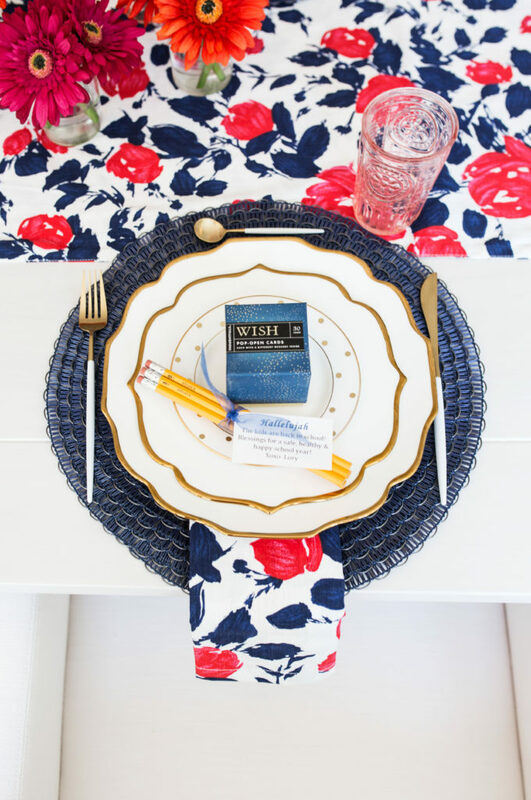 It’s so versatile – all I need to do is add a fun salad plate like this gold polka-dot one by Kate Spade for Lenox, a vibrant napkin and placemat or unique napkin ring and I can completely change the look of these. 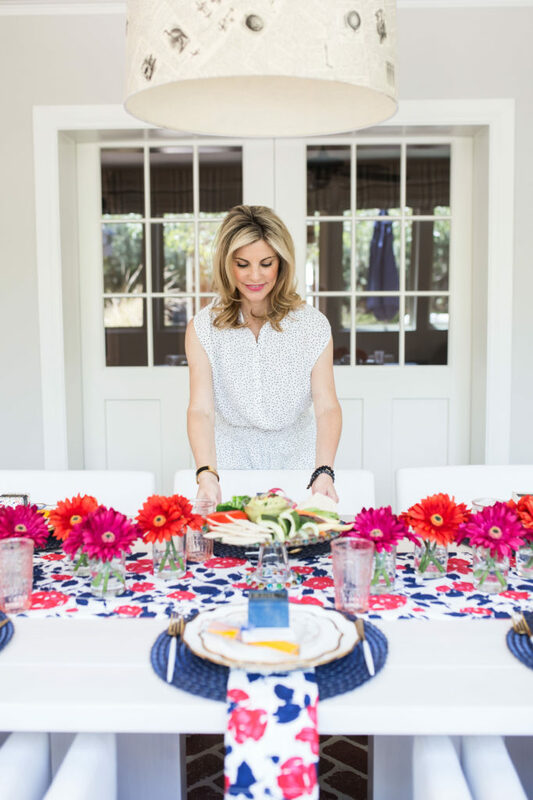 My most versatile dinnerware – Lenox tulip-shaped gold rimmed dishes. 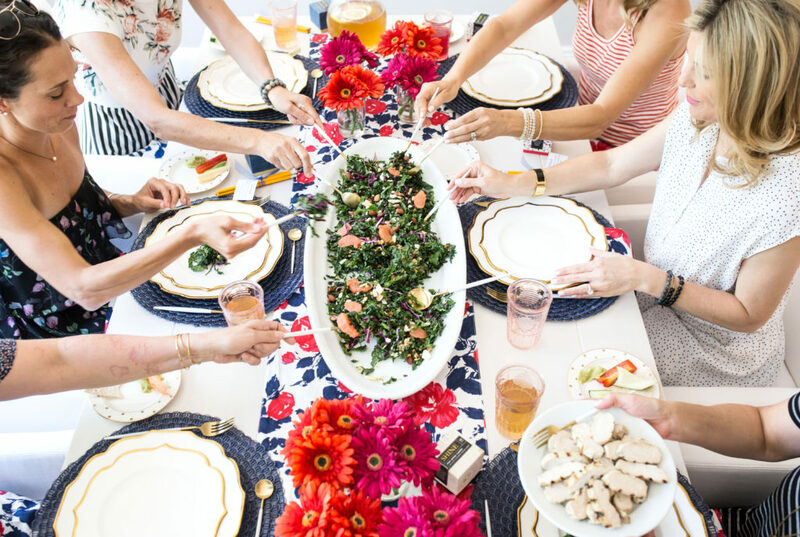 A polka dot appetizer dish from Kate Spade for Lenox gives a fun vibe to the setting. Favors are always appreciated, so I found these darling boxes of inspiration notes and gave each guest one to take home. Bunches of pencils are a whimsical touch, reminding everyone that the kids are definitely back in school! 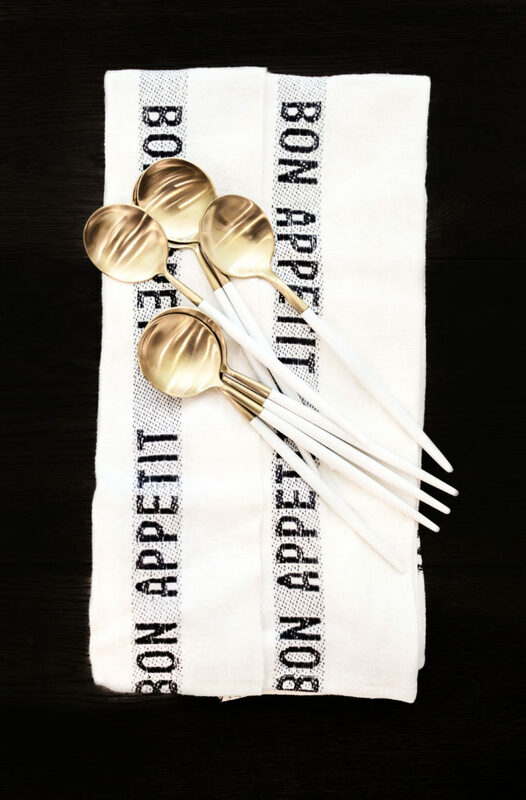 Flatware is my newest obsession (sorry napkins – you’ve had your turn and now I have more than I can handle) and these from Lekoch do not disappoint. They are a knock-off of the Cutipol brand, which is so lovely, but very expensive. Check out this gold and white flatware link for all of the color combos available. Quite frankly, I think these are just as stunning and make such an impact. At one-tenth of the price, I could get a another set! Hmmmm . 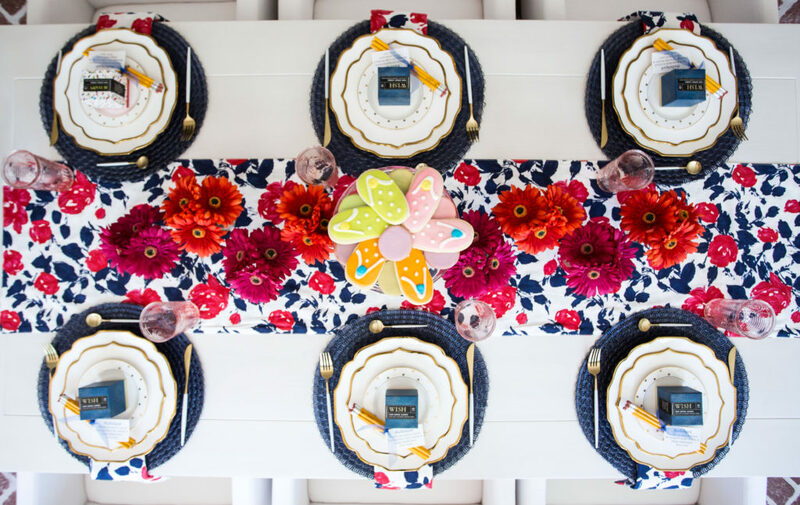 . .
Flatware is a great way to change up a table setting – but it can be pricey. Check Amazon for knock-offs of more expensive brands! Flower Child is a local favorite restaurant of mine – I ordered a couple raw veggie plates with avocado hummus and pita bread as a healthy appetizer. I used a cake platter to give some height to the table and make it more interesting than a flat plate or tray. 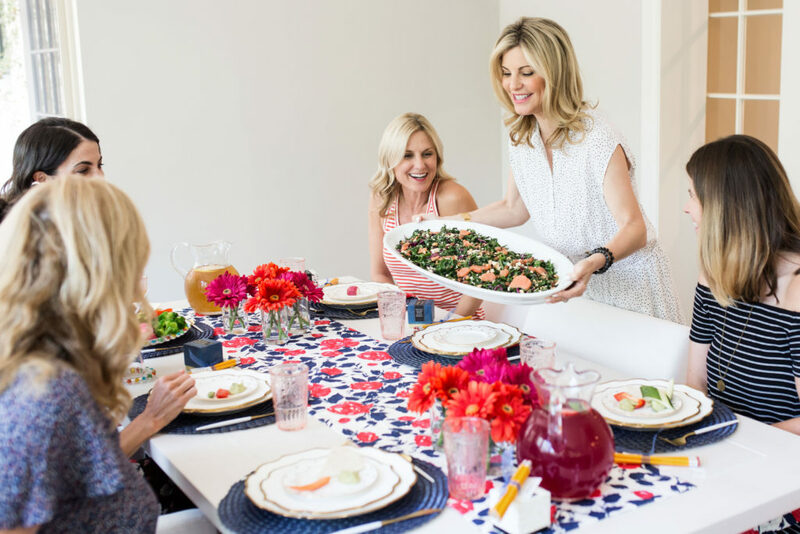 Kale salads are a mainstay at my house during the week and are a great choice for plan-ahead entertaining. This lettuce is sturdy enough to hold dressing for several hours if needed. Just pour the vinaigrette or dressing on the bottom of your platter and toss about 30 minutes before you want to serve. Don’t be afraid to order take-out. 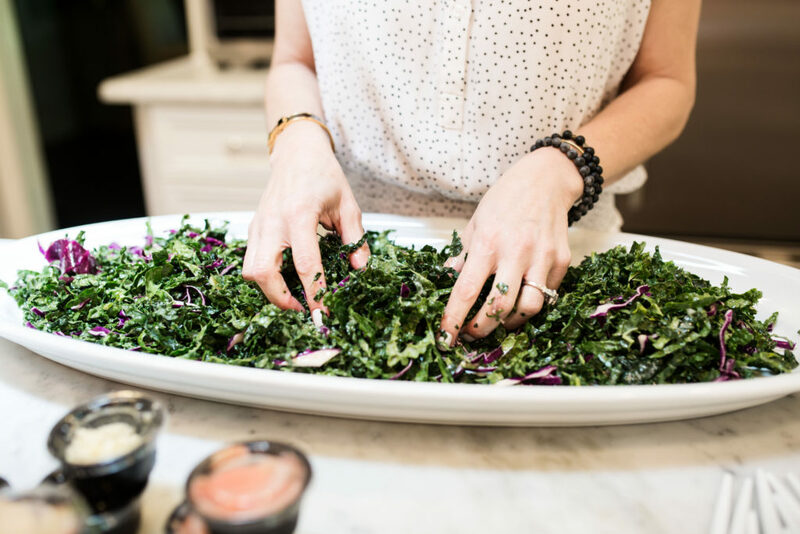 It can take a huge amount of stress off of food preparation! Ready to serve and only took me minutes! With segmented grapefruit, black currants, aged cheddar, smoked almonds, and an apple cider vinaigrette, it’s no wonder this is their most popular salad. Here’s a great recipe for the apple cider vinaigrette. Big enough to place in the middle of table – everyone had their own spoon to dig in, community style! Serving alcohol on the first day of school seemed a bit aggressive, so I opted for an energizing green tea that I garnished with fresh lemon slices and mint. 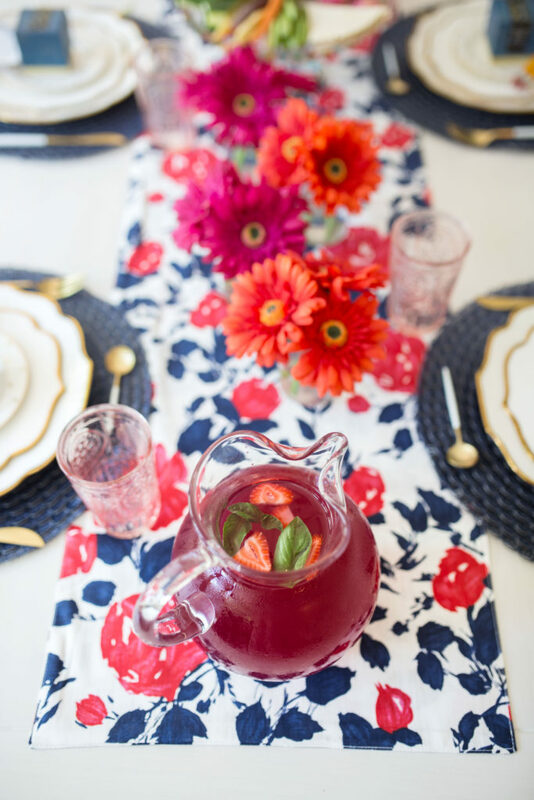 I also offered a refreshing blackberry lemonade with strawberries and basil snipped from the garden. Baking has never been my forté, so I always look to the pros for store-bought desserts. Barb’s Bakery is a favorite here in Phoenix and they always have the cutest and delectable cookies – flip flops were a perfect send-off to the summer. My other favorite is Tammy Coe Cakes – her round, glazed sugar cookies have just a hint of lemon and nutmeg for the best flavored treat in town. Cute flip-flop shaped cookies and colorful sugar cookies are a great treat – bonus that they are store-bought! A casual & fun afternoon! The table setting was comfortable & beautiful. I loved the favors too! Thanks so much for being there Vicki! It was so great to catch up over a yummy salad and great conversation! I am just dying over the idea of a Hallelujah Lunch! We don’t go back until the 20th, so we still have three more weeks here and I am not quite ready for them to go back, especially since it is my son’s senior year. 🙁 The table runner and gerber daises are fantastic! Beautiful post girl! All great ideas! In ten days I’ll be an empty nester, so it’s a big hallelujah in a sad way. I may need to do Kleenex boxes down the table! But I’m excited for all the new adventures coming all of our way. Love the Kate Spade runner and tribute. 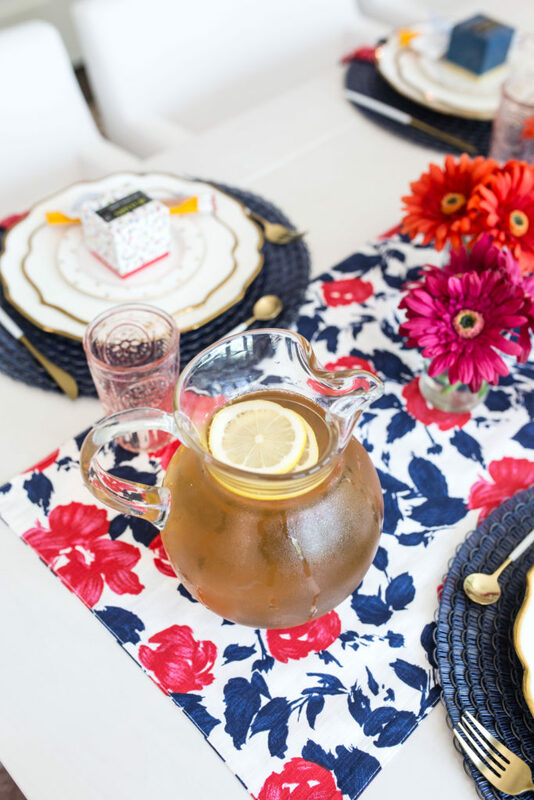 Thanks for sharing your relaxing party ideas! Thanks Leslie! So appreciate you following and your nice words. Good luck with the empty nester situation – I’m sure it will be hard, but what an exciting time for your daughter! !